Martin Puryear, Ampersand, 1987-1988. 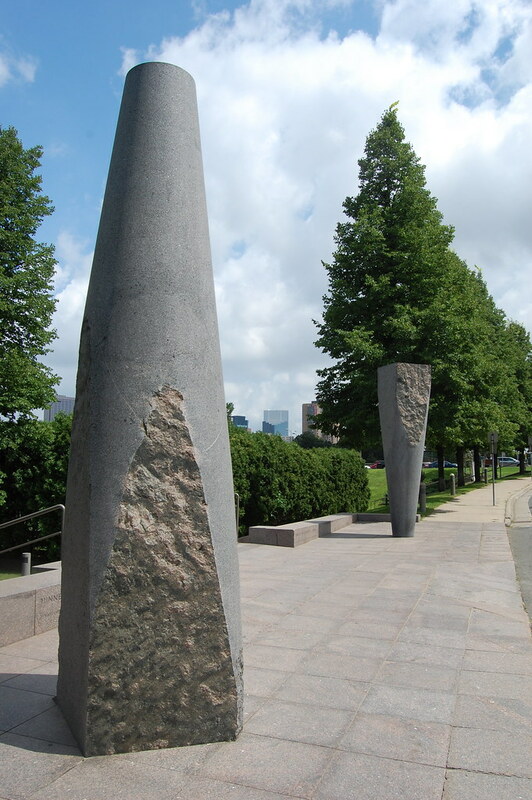 Granite, 167 x 36 x 38 in. and 163 x 36 x 36 in. 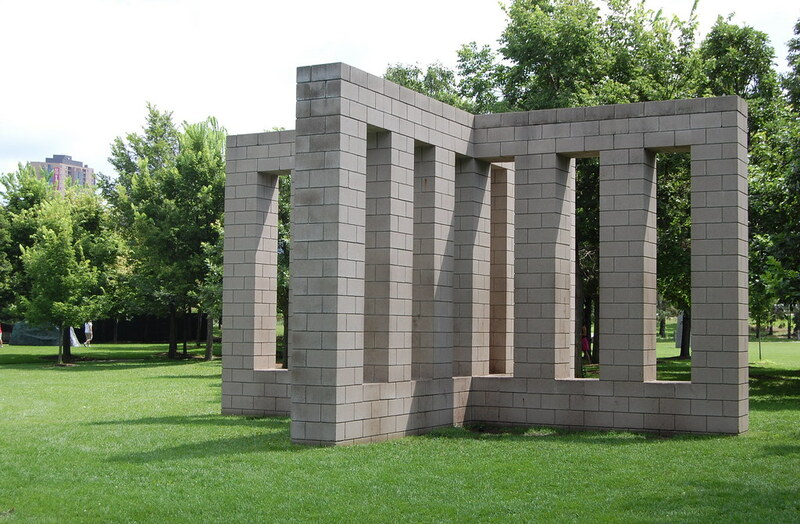 Sol LeWitt, X with Columns, 1996. Cinder block, concrete, 168 x 312 x 312 in. 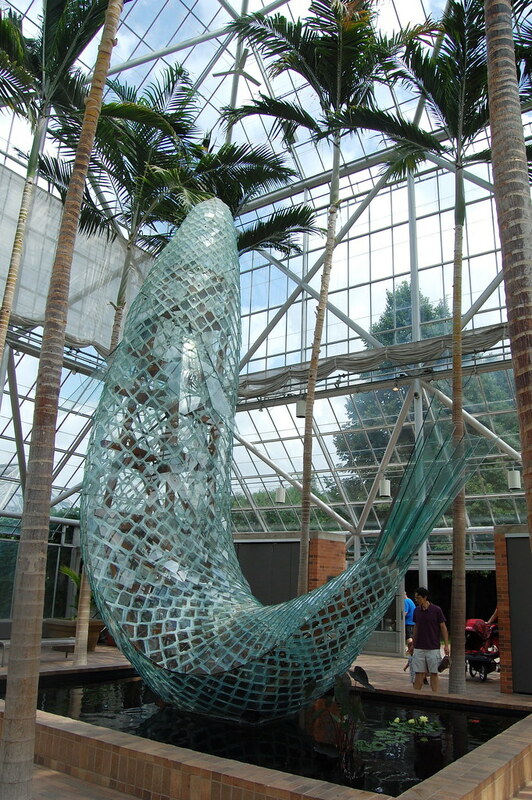 Frank Gehry, Standing Glass Fish, 1986. Wood, glass, steel, silicone, Plexiglas, rubber, 264 x 168 x 102 in. 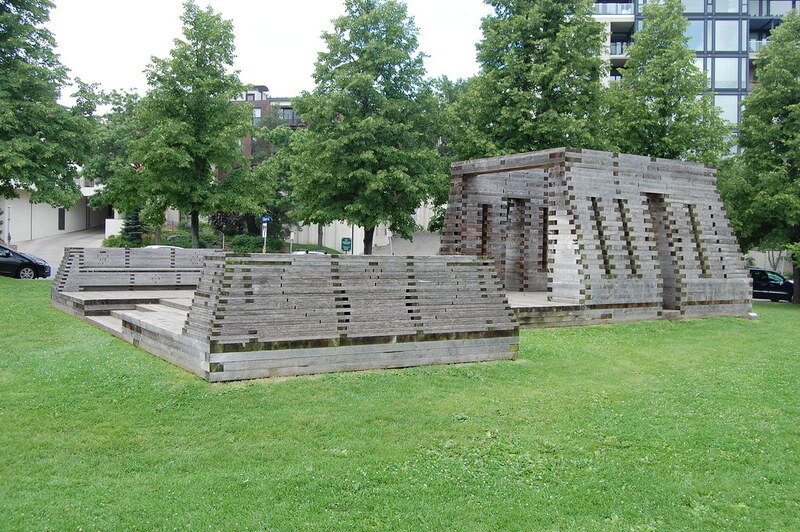 Jackie Winsor, Paul Walter's Piece, 1975. Copper, creosoted wood, 24 x 32 x 32 in. The Walker also owns a video by Jackie Winsor and Liza Béar documenting the creation of Paul Walter's Piece, 1975. 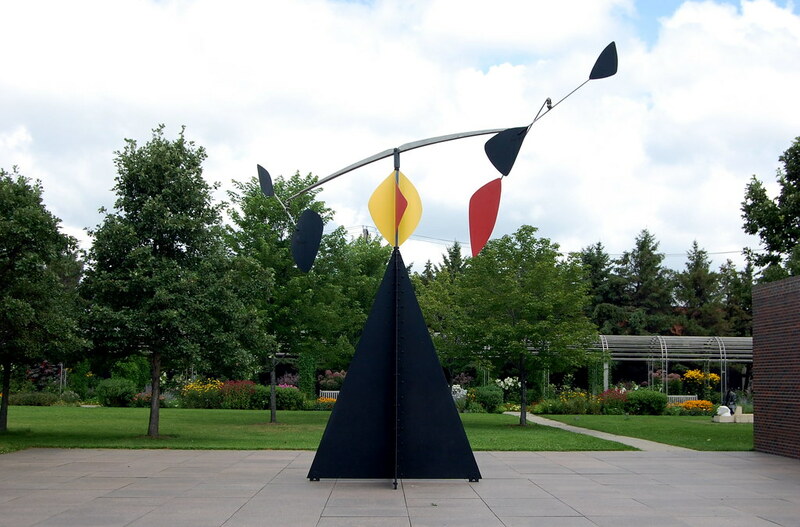 Alexander Calder, The Spinner, 1966. Aluminum, steel, paint, 235 x 351 x 351 in. 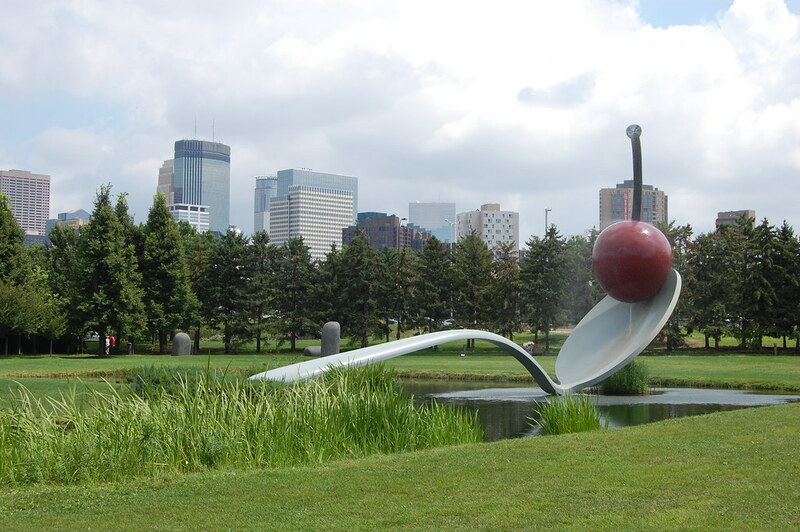 Mark di Suvero, Arikidea, 1977-1982. Cor-Ten steel, steel, wood, 316 1/2 x 510 x 450 in. 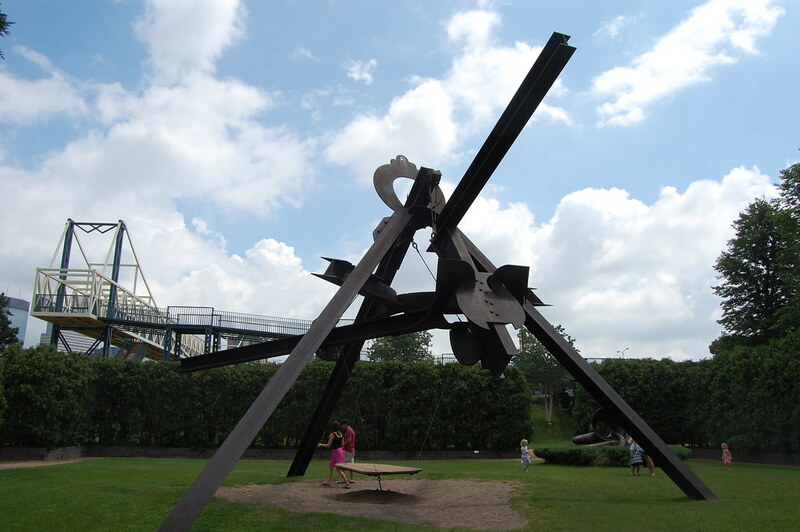 Visitors can ride on the small platform that is attached to the sculpture: an interactive Mark di Suvero! Said di Suvero, "Wouldn't a rusty brown spider standing on a bed of fresh snow be great to behold?" 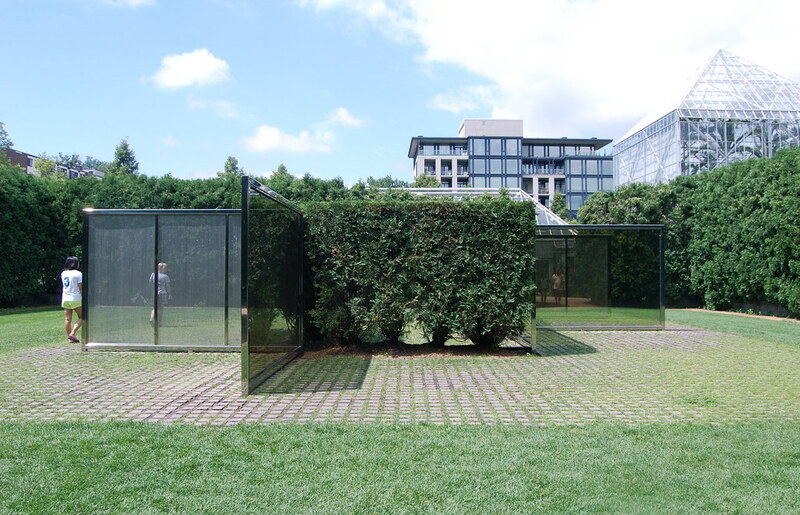 Dan Graham, Two-way Mirror Punched Steel Hedge Labyrinth, 1994-1996. Jackie Ferrara, Belvedere, 1988. Cedar, 126 x 506 x 407 in. 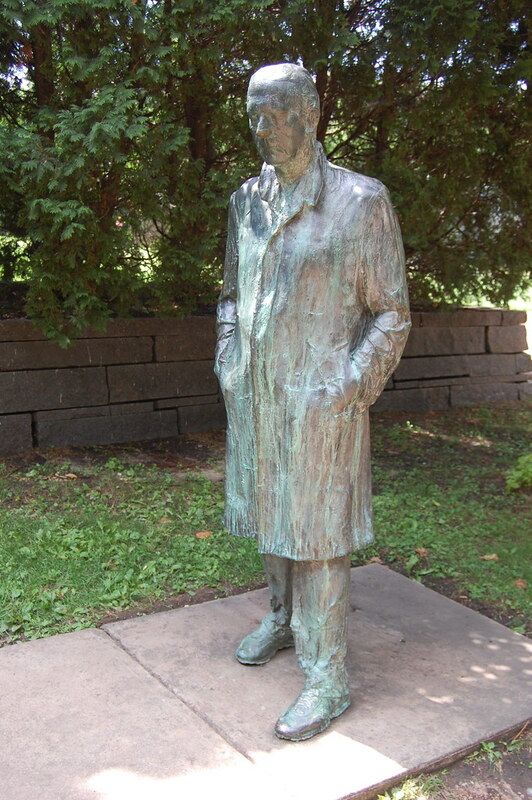 George Segal, Walking Man, 1988. 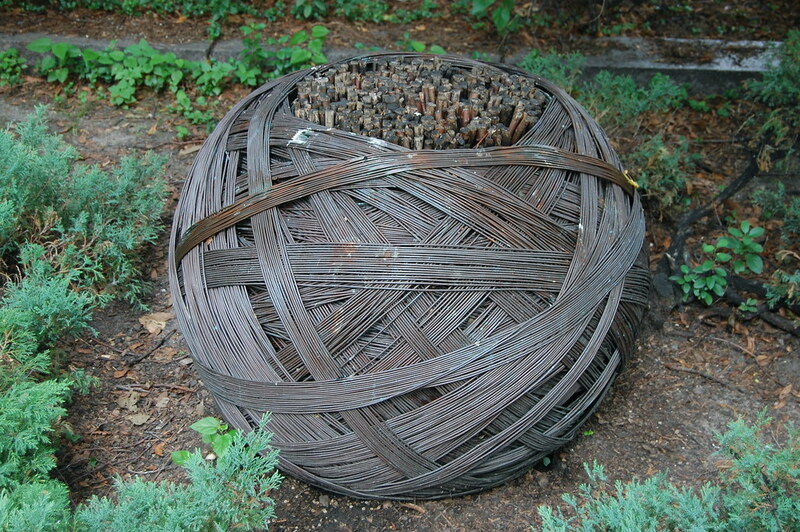 Bronze, 72 x 36 x 30 in. 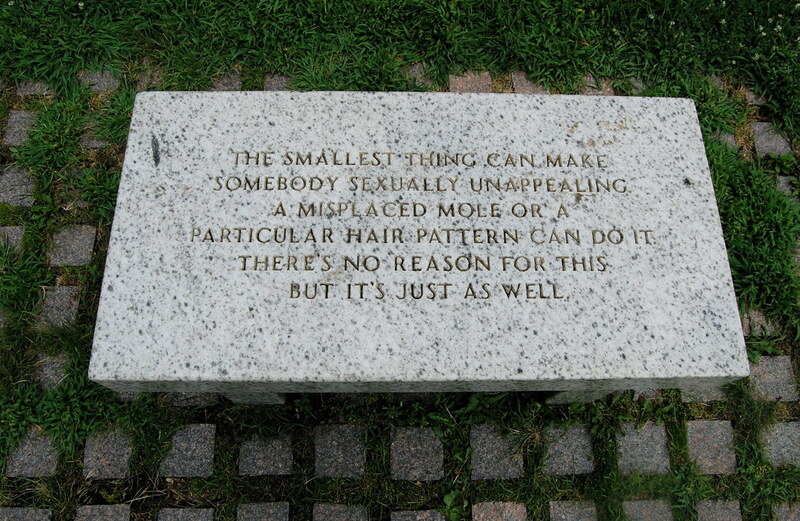 Detail view of Jenny Holzer, Selections From the Living Series, 1989. 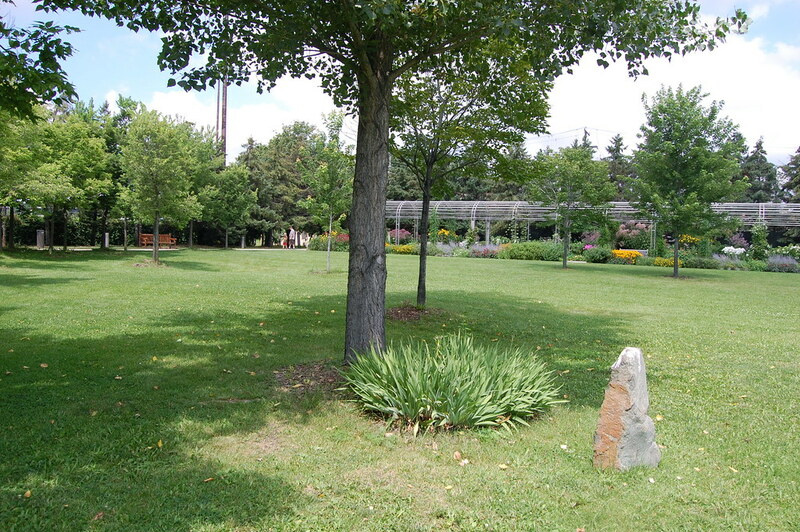 Granite, 28 elements: 17 1/4 x 36 x 18 in. each. 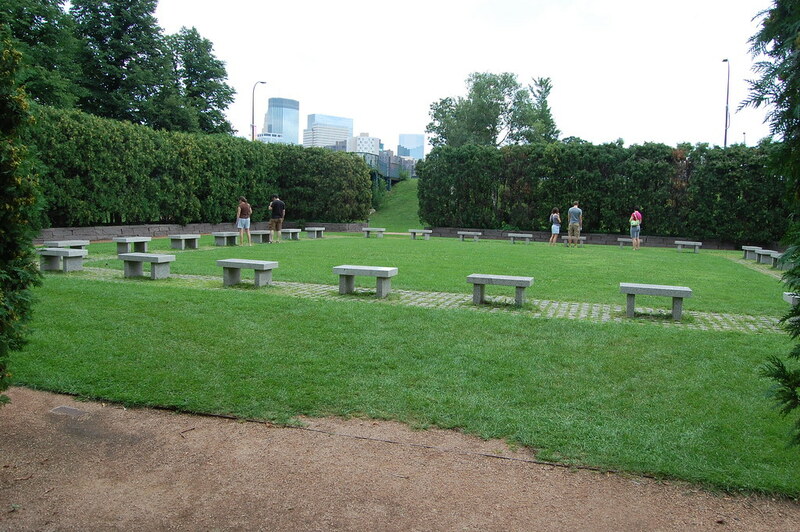 Installation view of Jenny Holzer, Selections From the Living Series, 1989. 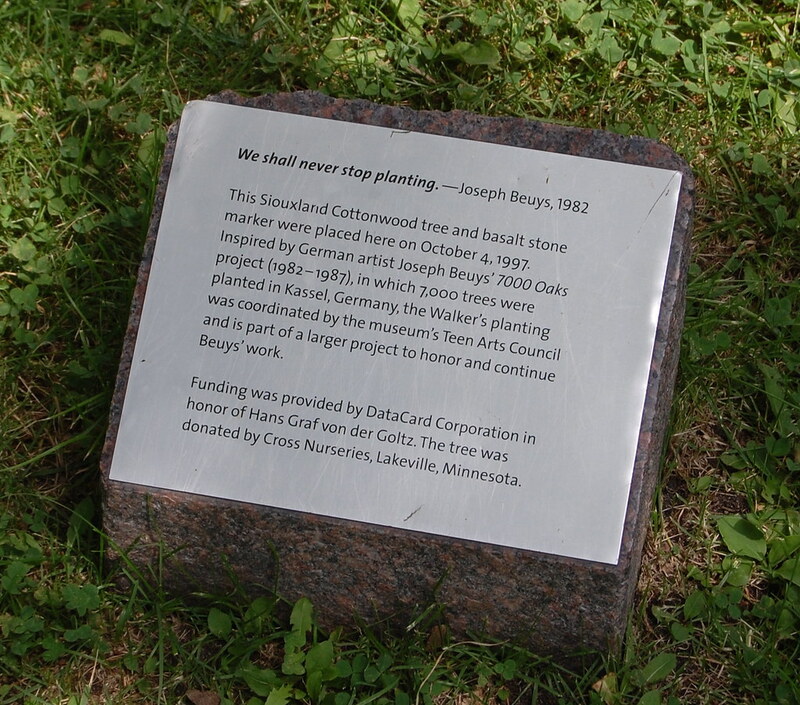 "The planting of seven thousand oak trees is thus only a symbolic beginning. And such a symbolic beginning requires a marker, in this instance a basalt column. The intention of such a tree-planting event is to point up the transformation of all of life, of society, and of the whole ecological system..."
More trees inspired by Joseph Beuys' 7,000 Eichen ("7,000 Oaks"), originally conceived for Kassel, Germany, are on view, thanks to Dia, on 22nd Street in Chelsea.